TUCSON, Ariz. – The National Guard is improving border security as Operation Guardian Support expands to Arizona’s ports of entry. Since the operation began in April, 491 volunteer National Guard members are now assigned to the Office of Field Operations nationwide including 40 at the Port of Nogales. National Guard personnel are inspecting cargo, assisting with x-ray machine operations, and completing secondary inspections, all vital aspects of protecting the U.S. homeland while facilitating legitimate trade and travel at Arizona ports of entry. Nogales Area Port Director Michael Humphries said Guard Members are allowing CBP Officers to focus on aspects of the mission that require law enforcement authority. 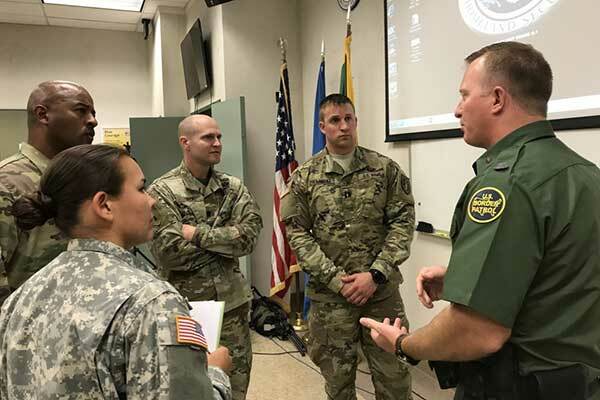 Area Port Director Michael Humphries praised the National Guard for their support, which acts as a valuable force multiplier for CBP operations. Task Force Guardian Commander Col. Hoyt Slocum, highlighted the expanding role of Operation Guardian Support at Arizona Ports of Entry by addressing members of the media and touring the Mariposa Crossing with Director Humphries. During the tour, Specialist Kimberly Burdick, a Guardsman from Wisconsin, said she wasn’t sure what to expect when she arrived, but was greeted by a welcoming Office of Field Operations who immediately made her feel like a valued member of the team. Col. Slocum emphasized border security and national security cannot be separated and lauded Guardsmen from Wisconsin, Indiana, Maine, Iowa, and Kentucky who volunteered to fill the Task Force’s ranks. Operation Guardian Support has proven a success along the Southwest Border, with National Guard personnel deployed to areas of Arizona, California, New Mexico, and Texas. U.S. Customs and Border Protection has a decades-long successful partnership with the Department of Defense and its National Guard.